As always, We would love to hear from you —tell us what wines you would like us to carry, what kinds of wines you want to taste at our thrice-weekly tastings on Wed. Fri. & Saturdays. And come in to enjoy a glass of wine at our wine bar every day. We have many fine wines across all price points for your delectation, and if you desire, we can make you a small plate of food to enjoy with your wines! 24 February 2014; Passito Wines - ancient and modern in one delicious glass! For the last two years, I have been researching our just released book: Divine Vintage: Following the Wine Trail from Genesis to the Modern Age (Palgrave-MacMillan).That research included nearly eight weeks driving all around that wonderful, diverse and VERY ancient land. Visiting most all of the wine regions, fine wineries and important archaeological sites/museums (Zeugma, Mt Ararat, Çatalhöyük) drove home (literally!) the incredible place Turkey holds in our vinous imagination. I have probably been to more Turkish wine regions and wineries than any other non-Turkish person, and honestly can say that today's Turkish wines are among the most interesting, intensely flavorful and unique wines to be had today. The nature of this modern Turkish wine renaissance coincides with modern research suggesting that Turkey may in fact be the original site of wine-grape domestication, dating back perhaps 9000 plus years ago! The map above, created by my friend Murat Yanki in Cappadocia, an ardent Turkish vinophile, photographer and writer, showcases the great ancient vineyards and "wine" cities. While speaking on Turkey's indigenous varieties three weeks ago at the European Wine Bloggers' Conference in Izmir, my friends José Vouillamoz, the grape geneticist and co-author of Wine Grapes, with Jancis Robinson MW and Julia Harding MW, along with Patrick McGovern, Professor of Molecular Archaeology at U. of Pennsylvania Museum and ardent ancient alcohol buff, provided strong evidence that furthered this hypothesis, using excellent historical/archaeological facts combined with the most recent DNA analyses and data on wine-grapes, founder areas and linguistic analyses. On the map above, the area of SE Anatolia around Gaziantep, Andaman an Sanliurfa south of the Taurus Mountains, has become Vouillamoz's target region for domestication according to much evidence discovered over the last several decades. The fact that Turkey has over 1000 indigenous varieties, many still cultivated in the ancient manner as bush vines and with strong, regionally diverse identity and genetic differentiation, suggests that Turkey is a likely "origin" point. My "aha" moment came first when I arrived in the town of Kalecik, east of Ankara, home to VinKara Winery and the homeland of my favorite red Turkish variety, Kalicik Karasi (the black of Karasi). 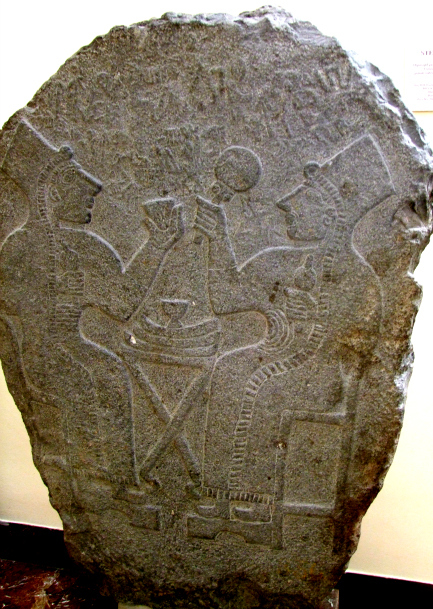 Kalecik lies about 100 km NW from the ancient Hittite capital, Hattuºa, which flourished 1900-1350 BCE. The Hittites had a very strongly developed wine drinking culture, and planted grapes throughout their extensive empire, and loved nothing more than to party at banquets with lots of wine! The Red River Valley where Kalecik, with its alluvial rocky soils overlaid by wind-blown silts and ancient fortress, has nurtured vineyards for many millennia. The Kalecik Karasi grape's origins have not been completely determined via DNA analyses, Vouillamoz notes, but its taste, its "feral" bouquet, delicate color and refined flavors certainly convinced me that it has some ancient "blood" in its lineage. "KK" (Turks hate this abbreviation, but it does save space!) has the earthy-floral bouquet of Etna's Nerello Mascalese, the light ruby-garnet color of Nebbiolo and th sweet, supple cherry-laced flavors and soft tannin of Pinot Noir; all "primitive" (in the sense of earlier origins) varieties. 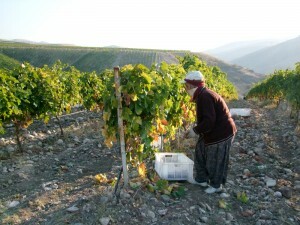 Seeing the vineyards near dawn being harvested by Muslim women, the rocky soils, the nippy temperature typical in the continental climate-influenced regions of Anatolia, it was very easy to imagine the Hittite ancestors of these women also toiling away on a long ago October morning. If one overlays a map of Turkey's current main wine regions over the map of ancient Turkey above, you will see a strong correlation of sites. Ancient Hittites, Phyrgians, Greeks and later Romans clearly were attuned to the best terroirs of their time! 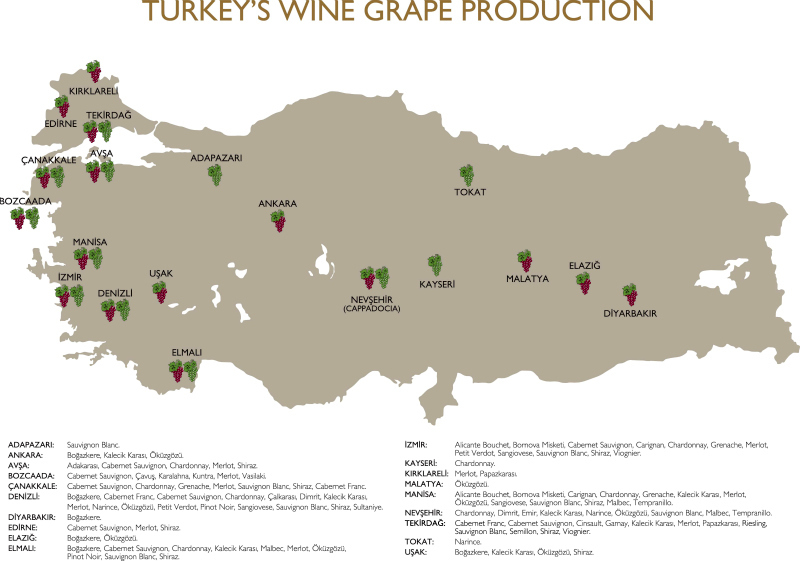 Turkey's other top indigenous varieties, such as the red grapes Õkûzgȍzû and Boǧazkere, the white grape Narince and many others all produce fascinating wine with flavors and appeal that hint at their possible antiquity. More importantly, as I noticed throughout Turkey, today's fine producers like VinKara, Kavaklidere, Kayra, and Sevilen are firmly supportive of their native varieties, extending their production in regions outside of their origins. From virtually no serious wine production 15 years ago to over 100 wineries today, Turkey's lost heritage of fine wines is now being revived with zeal, style and an awareness of past glories. For me, the real glory is Turkey's old native varieties!